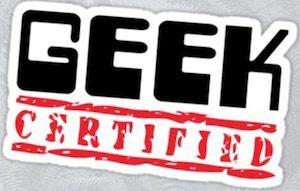 Now there is a nice die cut sticker that says “Geek Certified” and that means that you can stick them anywhere as you are the geek that can certify things. This vinyl sticker is just perfect to bring some boring things to life and that could be your laptop but just as well your car or maybe the fridge. The sticker is removable without leaving residue if you think the certification lapsed. So let’s stick some stickers but first order your Geek Certified Sticker. Angry Birds is fun and it became even better when they went to space and then from there to Star Wars. And now you can get Angry Birds Star Wars stickers. 4 sheets of stickers with a bunch of fun Angry Birds in Star Wars style. 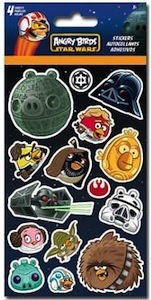 So if you like stickers, Star Wars and Angry Birds then you will love this set of Angry Birds Star Wars Stickers. 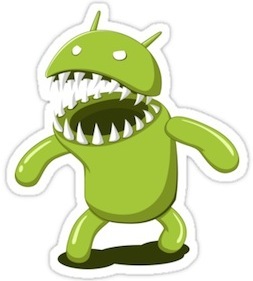 If Cut The Rope is your game and Om Nom your favorite monster then you should have a look at this decal. This decal works great on almost any laptop but specially on the metal Finnish of a Apple Macbook. As you can see on the picture the decal has Om Nom the you stick on the bottom of the screens back and then there are rope that of course need to be placed so that your computers logo becomes the candy that Om Nom wants. And now you computer is Cut The Rope the game and Om Nom is just waiting for the Apple or other logo to fall in his mouth. 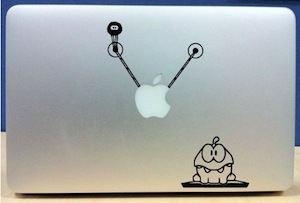 Come have a close look at this fun Cut The Rope Om Nom Laptop Decal. There is the new Batman or just the Android logo dressed up as Batman. This die cut decal shows a black Android with cape, Batman logo and special Batman eyes. A decal like this will look great on almost any flat surface like a car, laptop, book, fridge and so on. This sticker is 4 x 3.75 inch and is die cut so no white parts just the blacks. 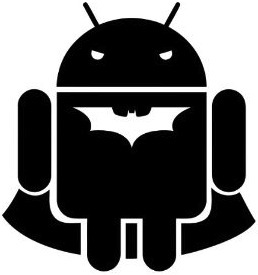 Come check out this special Batman Android Decal Sticker. How fun would it be if you could have this USB logo on your belongings? No worries because you can. 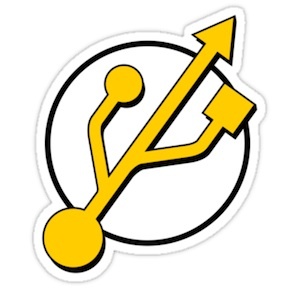 This die cut sticker shows a yellow USB logo agains a white background. And this sticker is great for on almost anything from your laptop to your car so yes it can be used outside to. 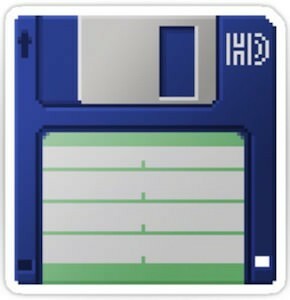 Come have a look at this USB Logo Sticker.